Tim Burton's latest addition to his weird selection of masterpieces is the latest adventure flick, "Miss Peregrine's Home for Peculiar Children" from the novel of the same title by author Ransom Riggs. In the story, Jacob "Jake" Portman (Asa Butterfield) tries to find out the truth behind the tragic death of his grandfather Abraham "Abe" Portman (Terrence Stamp), which will lead him to go to a remote island in Welsh. In here, he must find Miss Peregrine's (Eva Green) home to seek for help and know the mystery that surrounds his grandfather and his whole persona as well. During the search for Miss Peregrine and her home, Jake Portman discovers a secret loop that leads back in time to September 3, 1943, of course with the help of some of the peculiar children under Miss Peregrine's care. When he finally discovers Miss Peregrine's home, Jake found out that it was only the beginning of a great adventure ahead of him as he embrace his peculiarity as well. The "Miss Peregrine's Home for Peculiar Children" is one of those adapted for movie stories that contains a "lead character discovers the truth behind his/her personality" kind of story thing, which we find familiar with the likes of Harry Potter, Mortal Instruments, and Divergent among others. If we will just think of it, we can say that there is nothing really amazing about "Miss Peregrine's" story itself because it has been told many times and were adapted into movie several times before. 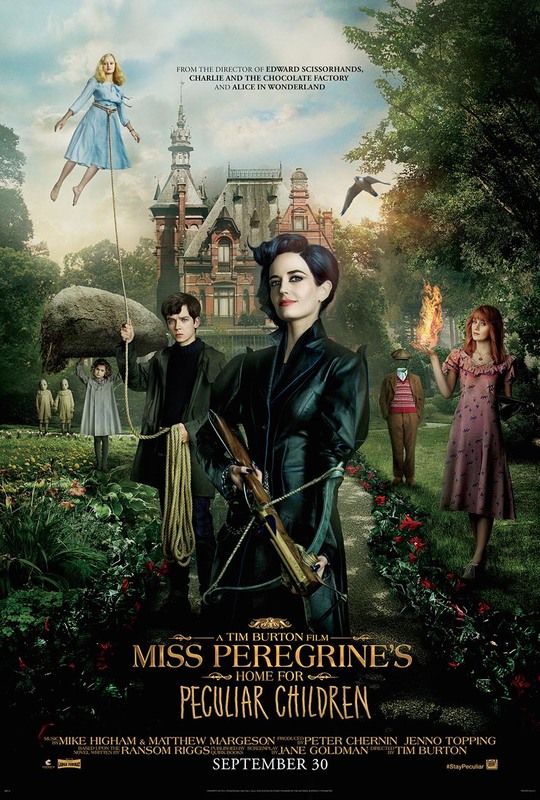 But what makes it unique is that "Miss Peregrine's Home for Peculiar Children" is like the X-men and Harry Potter movies for young adults adventure movie rolled into one, for its mystery and action details, which is a nice combination, actually! Tim Burton's visionary mind-setting in making a movie is really great when it comes to turning a novel or script or story into something more magical, engaging, and weird-looking such as those in Alice in Wonderland, Edward Scissorhands, and Sweeney Todd among others. In "Miss Peregrine's Home for Peculiar Children", we watched with excitement while watching every scene and felt that they are all familiar still yet there's always something new to offer. In this movie, Tim Burton has done a great job in presenting us a whole new world of alternate reality that we made to believe that there is really a loop somewhere and that peculiar children do exist! The imaginations have become real under Tim Burton's supervision and it's just great! Overall, "Miss Peregrine's Home for Peculiar Children" is enjoyable to watch, exciting, and quite entertaining. We give this movie an 8 out of 10 movie experience for visually stunning effects, amazing storyline, and believable outcome of the film. The movie is brought to us 20th Century Fox and still showing in movie theaters, nationwide! Watch "Miss Peregrine's Home for Peculiar Children" full movie trailer below. Enjoy!